These ones didn’t make the list. If you are only in Rome for a couple of days, these won’t give you the full Roman wine bar experience, but if you are hanging out for awhile, there are still reasons to try these out. 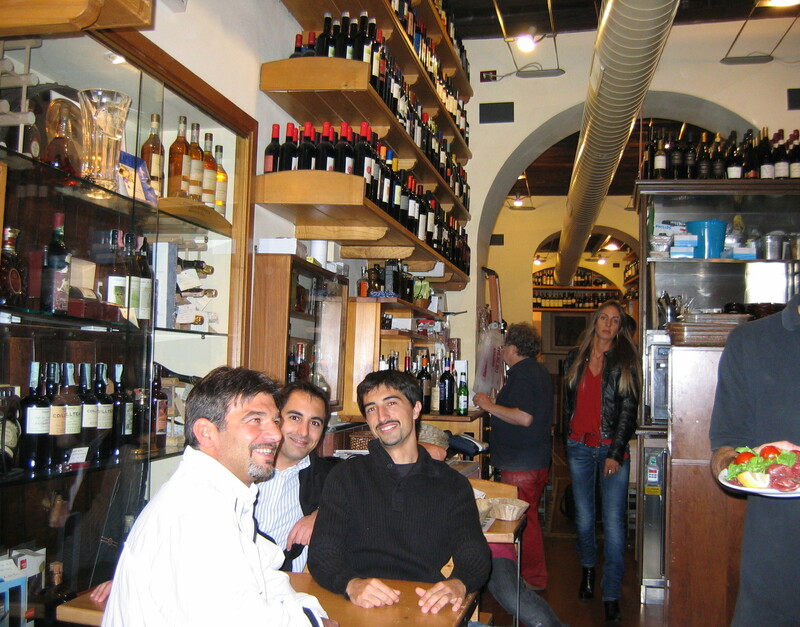 Enoteca Piccolo – small selection, but other than Cul de Sac and Il Simposio, the only other one with outdoor seating. ‘Gusto– Huge, modern interior. ‘Gusto is a pizzeria, restaurant, grocer AND wine bar. Nothing about this place feels Roman to me. Casa Bleve – In a 15th Century building off of Piazza Navonna. Very elegant, but very expensive. Palatium – Specializing in the not-that-great-but-interesting wines of the area (Lazio). This is an excellent place for lunch as it serves very authentic Roman cuisine. Always hopping with locals. By the Spanish Steps. Hint: At many places you can reserve a table! It’s such a drag to enter a fun, crowded bar and find out there are no available tables. But a little-known secret is that many of these places will take reservations. Numerous times we got dirty looks from people who had been waiting a long time but because we called ahead, we got seated right away. 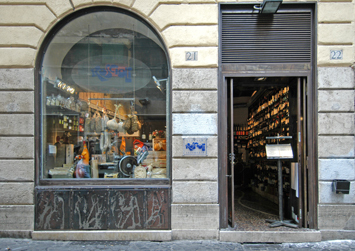 Cavour 131 is one of the first Enotecas in Rome, and still one of the best. Extraordinary wine selection, and changing menu every day. ah yes…those chance meetings at the roman strongholds. As a 13 year resident of this eternal city, love your selections! One left off which is worth slipping into, though. It is the original Casa Bleve in the Ghetto. La Vecchia Bottega del Vino where Gino not only has the battle horse bottles, but modern, interesting wines and a selection of cheese and deli-select foods that sing in harmony with the imbibables. Robin, next meeting won’t be by chance..and it will be there. I think that you should also include some great photos of Italian arm candy of the male persuasion in your blog. Bring one home for me! Seriously, what a wonderful adventure. Thanks for the great list. Aaaaahhhh… to be in Rome instead of organizing yet another year of Kids Korps events. Luck gal. I knew you couldn’t make it. Just wanted to keep you posted to the excitement in my world too! LOL. Looks like you are still enjoying EVERY moment. Love to keep up with your adventures. What a terrific post…if only San Diego could create as many fun, interesting wine bars with good food (only a couple come to mind). I look forward to more posts from your trip! Your trips sound FABULOUS; I hope that I can one day make it onto one of your adventures!! How is the wine at the wine bars? Big ol rip off’s like in America? I remember in Italy i was drinking some great wine for ridiculously cheap prices! One of the best things is that the pricing of bottles is just a little over retail. Glasses were typically 6 to 8 euro, and if you are in denial like me, and tell yourself that 1 Euro = $1 then that’s a MUCH better deal than in the States! Please Lord, deliver me from $15 wine-by-the-glass pricing! Your wine tours and bike tours look fantastic! Ah, the wine in Rome, truly a great sampling of the best Italian wine. Although I just got back from tasting some of those “best Italian wines” with you in Nothern Italy I can’t wait to get back and go to Rome Italy and do some more Italian wine tasting at these Rome wine bars and discover some more of the best Italian wines (YUMMY). I love all things Italian! Especially wines from great Italian wine regions and traditional Italian wine producers and the wine bars in Rome sound like THE way to try the best Italian wine out there! Last trip I had a teaser from a few of the the best Italian wine bars in Rome Palatium, Trimani and a few other Italian wine tasting bars but I my next trip I will refer back here to see what additions to the best Italian wine bars in Rome! I agree Culdesac in pz. pequino has a fablous list of wines. Also in Coco & Mimi has a good wine list. At least some Ornellaia on there. Another great place is Enoteca Capranica. We had the best thin crust pizza and great wine list. The owner Mauritzio is very nice. Very inviting inside. Seems as if the wine bars in Rome have the best wine list at good prices. My friend and I are off to Italy in a week to travel the country for a month, first stop Rome and it is also the last stop a few days each, thank you so much for the insight. We will be sure to check them out! Grazie! Additionally, any idea’s for things not to miss beside the obvious would be wonderful. We are wine lovers going to: Rome, Naples, Amalfi, Florence (Pisa, Lucca), Cinque Terre, Milan (Como), Venice, Siena, Orvieto and back to Rome. We would love to attend a wine/cheese tasting someplace, and a tour of a vineyard would be wonderful. Biking in the countryside would be lovely as well. We are just two female friends going on a trip of a lifetime, long awaited dream vacation now that the kids are gone! Most recently, at the annual natural wine makers exhibition, everyone told me I could find their wines at Wine Concept.